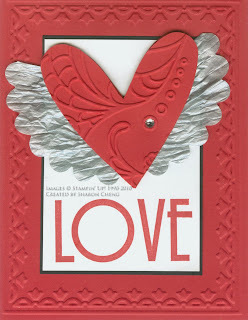 You can see this card and other new samples from the Occasions and Sale-a-Bration mini catalogs at my open house. We'll also have a free make and take and lots of retired stamps and other items priced to sell. With 5 demonstrators participating in this event, you'll see many different samples and lots of bargains. Are you still doing this today even though it's raining? Please update your post and confirm this is still a go. I will be coming from Plano and don't want to drive it if you don't have it. Hi Joy ... Yes, this is still a go and we look forward to seeing you!! Do it by yourself and enjoy the fun!At New Year and always, may peace and love fill your heart, beauty fill your world, contentment and joy fill your days! Awesome card! I just love the use of the scallop circle for the wings--you're brilliant.